By Robert Romano — One of the political rationales for giving the Obama Administration what it wanted on the payroll tax holiday and unemployment benefits extensions — which will add $101 billion to the debt this year alone and is not paid for — was to avoid another showdown in Washington, D.C. Previous battles between the House and Obama — on continuing resolutions, on the debt ceiling, on the payroll tax in Dec. 2011 — have not boded well for Republicans, so the thinking goes. Therefore, to take the issues off the table, House leaders agreed to a conference report with their Senate counterparts, thereby avoiding controversy. Right? Wrong. 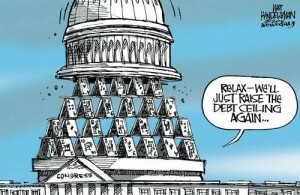 Ironically, in the process, House Republicans may have guaranteed that another controversial issue comes up before the election — the $16.394 trillion debt ceiling. According to the Office of Management and Budget, by Sep. 30, debt subject to the limit was going to total about $16.334 trillion. However, with the additional $101 billion being added to the debt thanks to extending the payroll tax holiday, unemployment benefits, and the “doc fix,” that means debt subject to the limit would be $16.435 trillion by the end of the fiscal year. 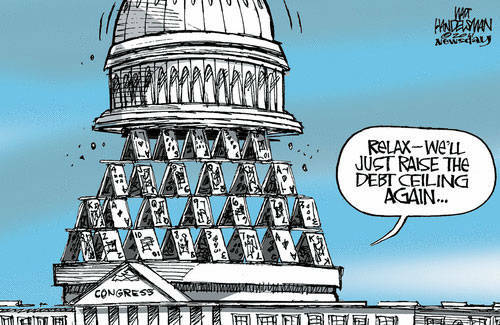 That makes another vote to raise the debt ceiling virtually assured before the election. So, to avoid one controversy, Republicans have created another one that may be more problematic politically. Republicans could have opposed extending the payroll tax holiday on the basis that it would hasten the bankruptcy of Social Security, and the unemployment benefits because welfare does not create jobs, does not prevent foreclosures, and is only adding to the debt. By supporting it, now the House GOP stands to dispirit their conservative base of voters not once, but twice this year by their failure to rein in the debt. Because when the debt ceiling issue comes up again, nobody expects Republicans will get any real spending cuts in return. Nor does anybody expect them to even fight for real cuts any more. They are losing credibility at a geometric rate. So, right before the American people go to the polls, they will be witnessing Congress give Obama another blank check — with Republican approval. Obama, who has added more to the debt than any other president in a single term of office. But perhaps this is what they deserve for governing not on the basis of principle, but on the basis of seeming political expediency. Sometimes when you postpone a battle, you guarantee an even bigger one down the road where the stakes couldn’t be higher.